Our clients have trusted us for over 25 years to help them pursue their financial futures. Our goal is to help our clients prudently invest their assets from early in their working years through retirement. Welcome to BSB Financial Services, Inc.
We understand that financial planning is a highly individual, lifelong process. Throughout each stage, your goals, risk tolerance, and future plans will change, and we’re with you every step of the way. The backbone of investment management is managing risk. With this focus, we help you evaluate your current financial status and guide you to an appropriate, personalized plan that will best help you reach the financial future you want. Ready to invest in your future? Explore our financial planning areas below. The FIVE STAR Wealth Manager list is created by Crescendo Business Services LLC. It includes less than 41 percent of 923 wealth managers in the Milwaukee area in 2016. Award candidates are identified by one of three sources; firm nomination, peer nomination or prequalification.. Wealth managers were evaluated across ten criteria: (a) Credentialed as an investment advisory representative or a registered investment advisor; (b) Actively employed as a credentialed professional in the financial services industry for a minimum of five years; (c) Favorable regulatory and complaint history review; (d) Fulfilled their firm review based on internal firm standards; (e) Accepting new clients; (f) One-year client retention rate; (g) Five-year client retention rate; (h) non-institutional discretionary and/or non-discretionary client assets administered; (i) Number of client households served. (j) Educational and professional designations. Favorable and unfavorable evaluations are included in the score. Each wealth manager is reviewed for regulatory actions, civil judicial actions, and customer complaints. A favorable regulatory and complaint history is defined by Five Star Professional to mean that the wealth manager has not: *Been subject to a regulatory action that resulted in a license being suspended or revoked, or payment of a fine; *Had more than a total of three settled or pending customer complaints filed against them with any regulatory authority or through Five Star Professional’s consumer complaint process; *Individually contributed to a financial settlement of a customer complaint filed with a regulatory authority; *Filed for personal bankruptcy; *Been convicted of a felony. Five Star Wealth Managers do not pay a fee to be considered or placed on the final list of Five Star Wealth Managers. Scores reflect an average of all respondents and are not representative of any one client's evaluation. The Five Star award is not indicative of the wealth managers’ future performance. Wealth managers may or may not use discretion in their practice and therefore may not manage their clients’ assets. Working with a FIVE STAR Wealth Manager or any wealth manager is no guarantee as to future investment success, nor is there any guarantee that the selected wealth managers will be awarded this accomplishment by Five Star Professional in the future. 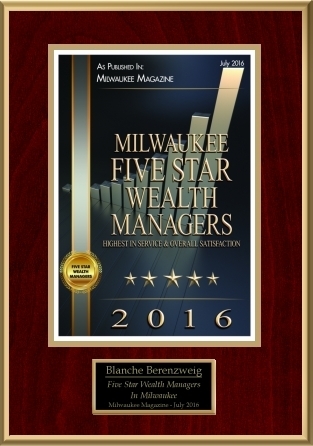 The inclusion of a wealth manager on the Five Star Wealth Manager list should not be construed as an endorsement of the wealth manager by Five Star Professional or the magazine. Five Star Professional is not an advisory firm. For more information on the Five Star award and the research/selection methodology, go to: fivestarprofessional.com. Thinking about your financial future? Whether you’re growing your retirement savings or you’re already enjoying your after-work years, we’ll help you pursue your financial goals. You’ve hired the best employees; now it’s time to retain that talent. We’ll help you design an employee plan focused on financial independence while pursuing company objectives. Get the most out of your investment. From purchasing your first term insurance policy to acquiring solutions for your financial portfolio, we have you covered at any stage of life. Our independent, fee-based investment advisory firm has been family-owned since 1989. Learn how we can evaluate your financial status and tolerance risk for pursuing your future goals. At BSB Financial Services, we’re committed to helping you navigate your long-term financial goals, using the best planning capabilities available to get you there. As a multi-generational firm, we understand the needs from early investing through post-retirement, and all the life-changing moments in between.